The Lever Brothers Company was established in Cambridge by William Lever. The firm was an American subsidiary of an English company of the same name. The Lever Brothers parent company had been manufacturing soap in England since the 1870s. Its most prominent brands included Sunlight soap, Lifebuoy soap, and Lux soap flakes. By the 1880s, the company had experienced significant success from its product line and began expanding production to meet international demands. The firm did not attempt to make an entrance into the U.S. market until the 1890s. Initially, in 1895, Lever established only a small office in New York to handle American sales; however, by 1898, the firm had purchased a Cambridge-based soap manufacturer – the Curtis Davis Company, which was established in 1835 and known for its Welcome brand of soap – to begin production stateside (Gale Group, 1998; Cambridge Chronicle, 1902). During its initial years in Cambridge, the Lever Brothers company saw only slow and steady growth. Despite the success of the company’s Sunlight and Lifebuoy brands overseas, the firm was unable to replicate these sales in the United States. As a result, the company’s primary product early on was the Welcome soap brand inherited from the Curtis Davis Company. In 1913, however, with the appointment of Francis A. Countway as company president, the firm began to see significant expansion in U.S. sales. Under Countway, the company initiated a series of American-focused marketing campaigns. By 1919, Countway additionally reorganized the company into several territories in order to expand sales nationwide. Countway eliminated production of Sunlight soap and instead focused on promoting the Lux, Rinso, Welcome, and Lifebuoy brands to the American public. As a consequence of Countway’s changes, sales in the United States rose considerably. By 1929, Lever Brothers was the third-largest soap manufacturer in the country, employing approximately 1,000 workers in its Cambridge plant and 1,400 workers total across the United States (Gale Group, 1998). Throughout the 1930s and 1940s, the company continued to experience steady growth in sales. While its overseas parent company was reorganized and merged into the new company of Unilever, the American Lever Brothers Company persisted in its efforts to gain a greater share of the American market. During this period, the firm acquired several companies and expanded its product lines to include artificial lard substitutes, oral hygiene products, and margarine. Between 1929 and 1934, sales for the company increased from $39 million to $91 million and profits increased from $3 million to $7 million. By the 1950s, American soap manufacturers had to face the emergence of synthetic soaps, which – despite their popularity – were expensive to produce and created environmental problems. Lever Brothers, in an effort to meet public demand, not only began to manufacture a synthetic toilet soap, but also purchased from the Monsanto Chemical Company the line of All brand synthetic detergents (Gale Group, 1998). Beginning in the latter half the nineteenth century, the Lever Brothers Company increasingly encountered problems with low profitability and rising production costs. The company, in response, attempted to restructure American production in order to increase their competitive edge (Gale Group, 1998). In 1949, the firm moved its headquarters and laboratories out of its Cambridge location to New York’s Park Avenue (Fouquet, 1949). 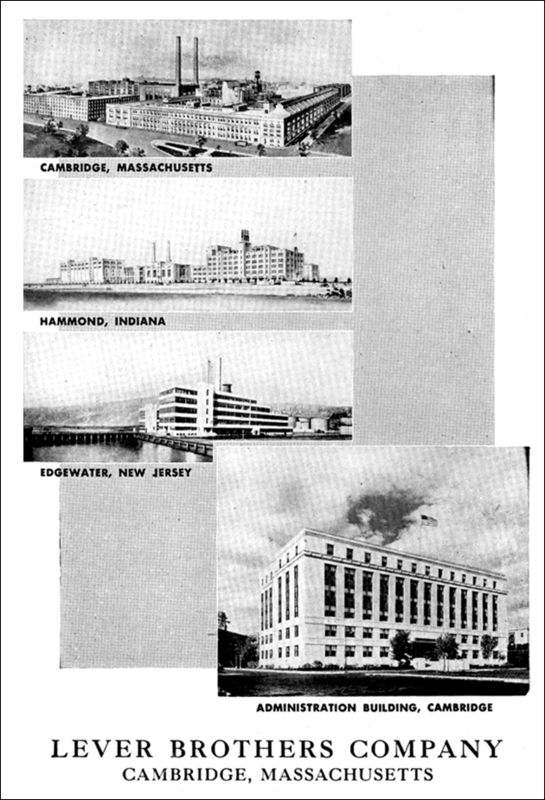 While production at the Cambridge manufacturing plant was expected to remain and expand in Cambridge, the factory was closed in 1959 on account of its obsolete technology and lack of suitability for processing synthetic soaps (Daily Boston Globe, 1959).